Scientists Track Chinese Space Station as It Falls to Earth - Integration Through Media ....! 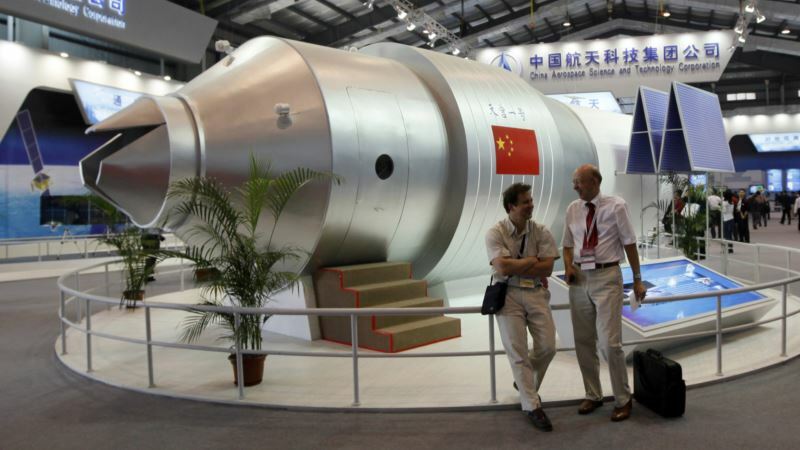 (VOA): Scientists are monitoring a defunct Chinese space station that is expected to fall to Earth around the end of the month, the largest manmade object to re-enter Earth’s atmosphere in a decade. The head of the European Space Agency’s debris office, Holger Krag, says China’s Tiangong-1 space station will likely fall to Earth between March 30 and April 3. Krag said it still not yet known where the space station will hit Earth, but said it would be extremely unlikely for anyone to be injured when it does. “Our experience is that for such large objects typically between 20 and 40 percent of the original mass, of 8.5 tons, will survive re-entry and then could be found on the ground, theoretically,” he said. “However, to be injured by one of these fragments is extremely unlikely. My estimate is that the probability to be injured by one of these fragments is similar to the probability of being hit by lightning twice in the same year,” Krag added. He said the space station is expected to fall between the areas of 43 degrees south and 43 degrees north, and everything outside that zone is considered safe. “Northern Europe including France, Germany, Austria and Switzerland are definitely on the safe side. Southern Europe, the southern part of North America, South Asia, Africa, Australia and also South America are still within the zone today,” he said. Scientists say it is hard to predict where Tiangong-1 will hit Earth in part because of its low orbit and high velocity. They say the space station is traveling 17,400 mph and orbits Earth about every 90 minutes. Tiangong-1 was launched into orbit in 2011 as China’s first space lab. It carried out orbit experiments in preparation for China’s plan to put a permanent space station into orbit by 2023.